You can blame climate change for the reason Dungeness crab season was delayed this year. Domoic acid, a dangerous neurotoxin that can cause loss of short-term memory, seizures and sometimes even death, became a problem because of unusually warm ocean temperatures off the West Coast from Alaska to California. These warm waters caused a bloom of an algae called Pseudo-nitzschia, which produces the domoic acid, and while the toxin doesn't affect crabs, clams, anchovies and other fish, it does build up in their bodies when they feed. It takes crabs a fair amount of time to purge the toxin from their systems once the algae bloom dies off. The Oregon Department of Fish and Wildlife declared Oregon's Dungeness to be safe for consumption as of January 4, 2016, nearly a month later than normal. One of my first responses, naturally, was to go out and buy one for myself. And since I'd been craving a fish stew, I decided to make my first ever bouillabaisse. Since I'd never made one before, some research was in order. The first resource was my icon of home cook-friendly French cuisine, Ms. Julia Child. One of her recipes calls for making a court bouillon of fish heads, bones and trimmings and adding onions, leeks, tomatoes, herbs and seasonings, which is strained and then used to cook live lobsters—two!—white fish, some shellfish and an eel. Yes, an eel. Well. 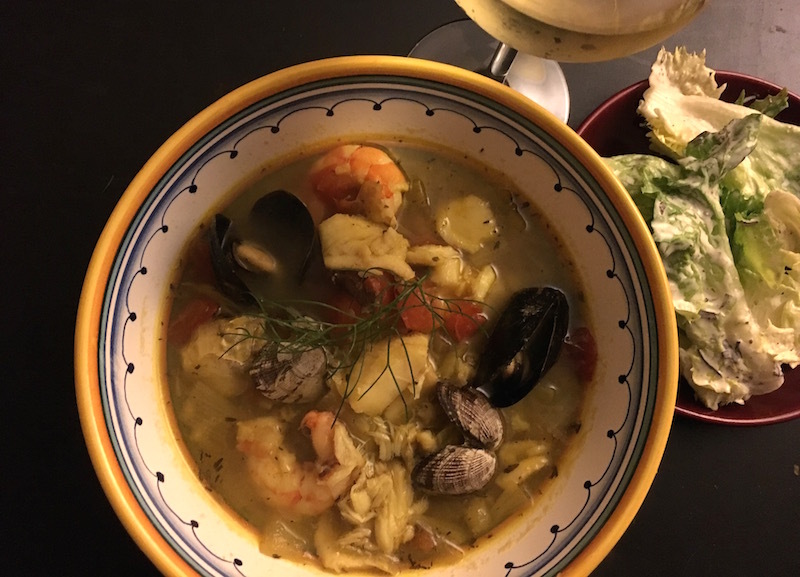 I moved on to Jimmy—you may know him as James Beard, but we're very close—who spent a great deal of time with Julia and whose bouillabaisse recipe is a somewhat simplified version of hers. Though I was impressed with his "soupe de poisson," which calls for taking a couple of pounds of fish (scales, bones and all), cooking it for about half an hour in water, then straining off the "juice" and adding tomatoes and onions to it. He then throws in some vermicelli, saffron and…this is so Jimmy…Swiss cheese! A couple of online checks and I had the basic outline of what I was going to do. All it took was a trip to the fish counter at the store, then picking up a couple of things that weren't in my vegetable bin at home, and within an hour of starting the process—thank heavens for having homemade fish stock in my freezer—we were sitting down to steaming bowls of this beautiful fish stew! Put saffron threads in mortar and pestle with salt and grind until the saffron is mostly powdered. Set aside. Heat olive oil in large soup pot or Dutch oven over medium-high heat until it shimmers. Add onion and sauté till translucent. Add fennel and garlic and sauté till tender. Add ground saffron, tomatoes, white wine and stock. Bring to a boil, then immediately reduce to simmer for 20 minutes. Add fish, shellfish and crab. Bring to a boil, then reduce to simmer for 10 min. For even more seriously great crab recipes, from crab cakes to chowders to pasta dishes, check out the Crustacean Celebration chronicles.